The oil and gas industry is witnessing a downturn like no other since 2014. The predicted ’lower for longer’ scenario has turned into the ‘lower forever’ future. The new reality is that returns have been slashed on the owners’ and suppliers side. Finding simpler and sustainable cost-effective ways to execute projects and deliver returns is critical for the survival of the companies serving the oil & gas industry. Asset Management involves the balancing of costs, opportunities and risks against the desired performance of assets, to achieve the organisational objectives. However, operator organisational structure can sometimes lead to “silo” based asset management leading to lack of joined-up thinking. This more often than not leads to sub-optimal asset value and operational efficiency outcomes. Our Production Value Asset Enhancement (PAVE) model is a holistic ‘full system’ approach to asset management. It is a system wide, reservoir to market, and integrated organizational approach to asset value enhancement. It is a structured, systematic, step-wise, proven approach to asset and organizational value enhancement concept specifically designed to help our clients with realizing maximum value from their existing assets. We work with our clients to examine the need for, and performance of, assets and asset systems at different levels. PAVE, enables the application of analytical approaches towards managing an asset over the different stages of its life cycle, which can start with the conception of the need for the asset, through to its disposal, and includes the managing of any potential post disposal liabilities. Implementation - Helping manage change culture and implementation on site. 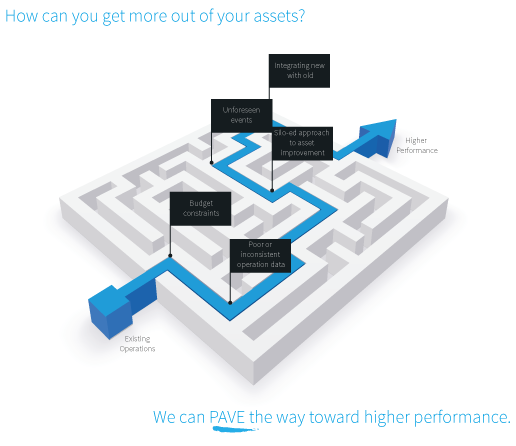 The core benefits of PAVE are that all opportunities for asset value enhancement including maximizing production, optimized asset integrity and organizational efficiency can all be identified and addressed in a fully integrated manner, resulting in a more cost effective and value enhancing way forward in the ‘lower forever’ operating environment.